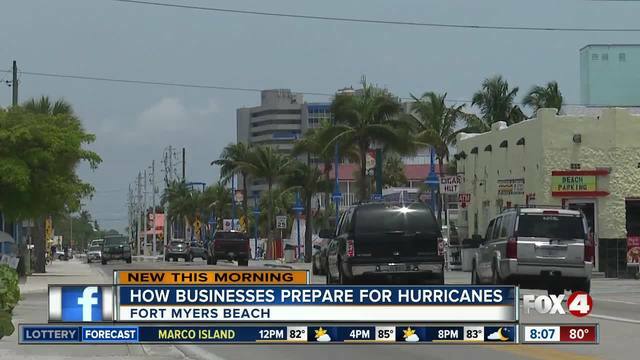 FORT MYERS BEACH, Fla. - The beginning of Hurricane Season will mean many people in Southwest Florida are making plans and buying supplies to reinforce their homes and for possible evacuations. People who own businesses in the area have to prepare twice as much. Preparing for storm means securing the home and their main source of income. Four in Your Corner spoke with local realtors on Fort Myers Beach who described how they're preparing for this season and what they learned from last year. Brent Perrine and Bill Pilcher are two of the owners of Island Life Realty on Fort Myers Beach. They told Fox 4 that the majority of their clients are seasonal residents who aren't typically in town for hurricane season and haven't experienced a storm before. “A lot of it’s educating them on making sure they have some sort of protection, hurricane shutters, impact glass”, Pilcher said. Pilcher is originally from Florida and knows how to prepare for a hurricane. Hurricane Irma didn't slow down the number of new clients they've acquired since then. He says he intends to pass along his knowledge to his clients so they're prepared for whatever comes. Last year before Hurricane Irma, Perrine and Pilcher spent time before the storm checking in on their clients' properties. This year Perrine and Pilcher are making sure their clients, new and old, know what to expect and how to prepare.